Let there be lights! Accessible lights! Injury Resources > Personal Injury Blog > Let there be lights! Accessible lights! In these darkest days of the year, it can be a frustrating challenge to keep the light in our days. The whole of the city starts to feel the palpable struggle against stress, loneliness, finances, bad weather and the like. One of the solutions? Bright lights and beautiful people, of course! On December 21st, on one of the longest nights of the year, Spinal Cord Injury BC set up a trip to VanDusen Gardens for their peers and community members to view the more than one million lights that made up their annual Festival of Lights – and luckily, I joined them. Now, I’m a born and raised Vancouverite. 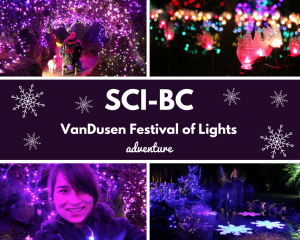 I’ve lived in the Lower Mainland since I was conceived, and yet, somehow, I have never been to VanDusen’s Festival of Lights. I know. Gasp. Shock. What kind of Vancouverite ARE you!? Still, to see the beauty of the Vandusen Gardens lit up like that was something truly worth the wait. I must send out a heartfelt thank-you to SCI-BC for setting up the occasion. Yet again I’ve been included, and found myself joining in on an activity I might not have otherwise experienced. As an ambulatory spinal cord injured person I do still love to do things like this, however, in all honesty, I worry occasionally about my ability to make it through. But with SCI-BC I know for certain that I will be taken care of and helped through in any way should I need. They help me exceed my own expectations of myself. The evening began with a lovely little dinner where everyone could say hello and catch up whilst filling our bellies with the warmth we’d later need during our cold foray into the forest of lights. Then slowly we filtered off to share in the adventure and enjoy an evening that was, thankfully, blessed without rain. It felt like a sparkly version of a snowless winter wonderland I am definitely going to have to experience again. These dark days can be harsh and brutal, but when communities come together and celebrate despite the darkness, I find the most joy. I will take this opportunity to thank all supporters of the SCI-BC program, including Murphy Battista LLP, who has been a consistent benefactor of SCI-BC’s Peer Support Program. These programs and events make a huge difference to people living with spinal cord injuries. No matter your reason for needing more light in your day, be it the usual day-to-day, or having to deal with a traumatic injury on top of that, I am grateful for the opportunities that can, quite literally, brighten up life. It’s these generous souls, and the incredible crew of SCI-BC, that help make this happen when it otherwise couldn’t. Happy brighter days, everyone – I wish you all the support and opportunity, should you need it!